The state has become the first to effectively ban medication abortions. Women in Arkansas will now only have one place in the state to get an abortion after the Supreme Court declined to take up an appeal by two Planned Parenthood-backed clinics regarding a law that essentially bans medication-based procedures. Arkansans used to have three locations to choose from to receive two types of abortions -- either medication-based or surgical -- but now only surgical abortions will be allowed. And there is only one location in the state that provides such procedures. Medication abortions involve a pregnant woman taking a pill to induce an abortion during the first nine weeks of a pregnancy. There were three abortion providers in the state -- two Planned Parenthood-backed clinics that provided medication abortions, and one private clinic that provided medication abortions and surgical abortions. Now neither of the Planned Parenthood facilities will be able to provide abortions, if the law stands, leaving the only facility in the state that provides abortions in Little Rock. "Arkansas is now shamefully responsible for being the first state to ban medication abortion," said Planned Parenthood Federation of America executive vice president Dawn Laguens. "This dangerous law immediately ends access to safe, legal abortion at all but one health center in the state. If that’s not an undue burden, what is? This law cannot and must not stand. We will not stop fighting for every person’s right to access safe, legal abortion," she said in a statement. 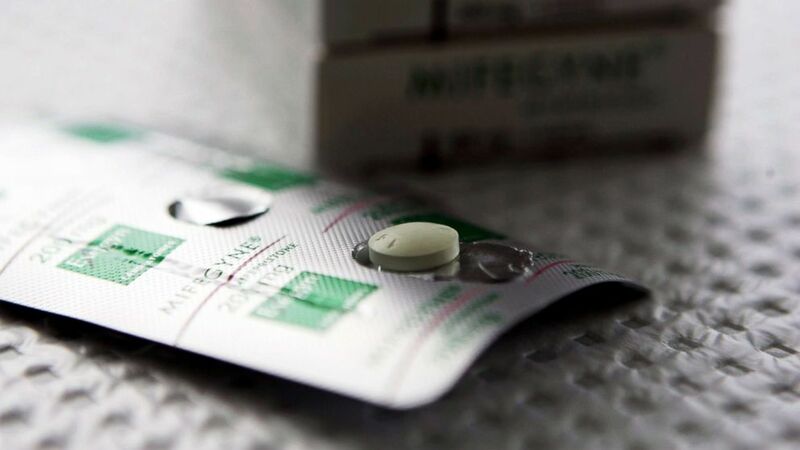 (Phil Walter/Getty Images) The abortion drug Mifepristone, also known as RU486, is pictured in a clinic. Arkansas Attorney General Leslie Rutledge has defended the law, arguing that it is needed because there are more complications with medication abortions than surgical ones. The law in Arkansas requires the medication abortion providers to have a contract with a doctor who has admitting privileges at a hospital in the state in order to address any complications, should they arise. A similar law in Texas, which required abortion providers to have hospital-admitting privileges, was struck down by the Supreme Court in 2016. Planned Parenthood is reportedly planning to seek emergency relief in the case from the district court, but for the time being the state is now allowed to enforce the law. This change comes on the heels of several other restrictive state-level abortion law changes. Earlier this month, the Iowa governor signed a so-called heartbeat bill into law, making it illegal to seek an abortion after a fetal heartbeat is detected, which could be as early as six weeks into a pregnancy. And not long after, a bill to ban abortion after 15 weeks into a pregnancy made steps in the legislative process in Louisiana, with the governor has publicly said that he would be in support of such a bill. The Louisiana bill is similar to a 15-week abortion ban that was passed in Mississippi in March. Prior to the passage of the Iowa “heartbeat” abortion ban law, Mississippi’s 15-week limit was among the most restrictive in the country.